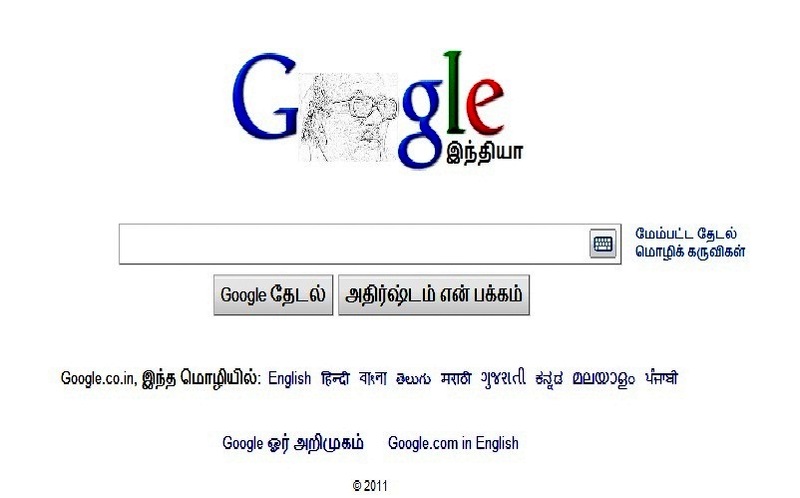 To Zero And Within: Google Doodle: Happy Birthday Karunanidhi! Here is a Google Doodle that Dennis Hwang should have made. His lack of respect towards our eternal leader appalls me. This doodle reflects Mr. Karunanidhi's pensive mood in this dire circumstances and hence won't contain his trademark lustrous yellow towel. Once again, Happy Birthday, Sir! May you live 100 years and be part of the 3G scam. Yes, Google home page should be in Tamil as a mark of respect.. Inspired from an article in Faking News.